The following broadcast may not be suitable for one-eyed Lithuanian midgets with false noses. Easy to spoof one, but, in truth, all those tedious little disclaimers are what make American television possible. Because, although there is no Constitutional Right not to be offended, defamation and slander are both serious crimes liable, upon trial and conviction, to cost big fines, possible professional ruin, and even jail time. So, disclaimers limit broadcasters’ legal liabilities. Engaging a nation teeming with grievance-collectors and their hungry lawyers, today’s TV might have ended up largely sports, cartoons, and cooking shows. Instead, before an episode opens, viewers can be warned about program content which might upset them. If they chose to watch anyway, they are chasing the shock they get. This fact alone comfortably alters a defendant’s standing in any free-speech suit brought against a network, producers, or sponsors. Everybody is so used to them by now, we barely notice anymore, although, so happens, I was there on the night of January 15, 1959 when my father invented TV disclaimers. Herbert Borkland Sr. grew up in Long Meadow, Massachusetts, son of a manufacturer so well thought of, the only instillation Rolls Royce ever built outside Europe went up next door to grandfather’s plant, since he had declined the prestigious company’s invitation to relocate to England instead. Herbert studied Law at Harvard University and went on to become Second Assistant to the Attorney General during the Roosevelt Administration. After World War II, when General Eisenhower was elected President, Herbert went into private practice with First Assistant Herbert Bergson, a direct descendent of French “vitalist” philosopher Henri Bergson. After work, Herbert played hard at a country club bachelor’s life, excelling in amateur athletics, especially golf and tennis — Spalding used to send over new gear for him to test before they put it on the market — until marrying famous beauty Margaret Mangan after her much-publicized divorce from the scion of the Bliss family, owners of the largest Washington, D.C. real-estate holdings ever amassed in private hands. Washington-based Bergson & Borkland became the most prominent anti-trust firm in the country, as was noted in the Sixties’ best-seller The Super Lawyers. Mum and I called him Borky. Borky was a serious but far from humorless father who proved to be among the most thoroughly honest Washingtonians of his generation. We know this because the Republican President’s FBI illegally raided Borky’s bank safety deposit box, searching for something, anything, to use to smear the previous Democratic Administration. The agents came up empty-handed. Mum and I could have warned them, knowing and loving the man as we did. 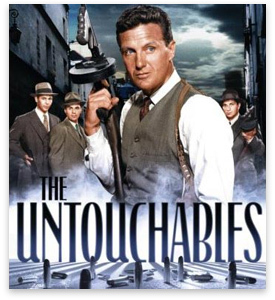 Now in the late Fifties, one of Borky’s clients, Paramount Television, bought the rights to a best-selling autobiography about the 1930s Prohibition Era war against crime-lord Al Capone waged by lawman Elliot Ness and his incorruptible crew Chicago newspapers dubbed “The Untouchables.” Nobly wooden Robert Stack played Ness, and tough-looking Neville Brand was Capone. The hard-hitting show became an immediate Sunday night success but was also controversial because pressure groups and even Frank Sinatra accused “The Untouchables” of defaming Italian Americans. As a result, Desi Arnaz — “I Love Lucy” co-star turned successful producer — bleached the Italian accents out of the cast and crafted scripts to also depict the positive side of Italian Americans. The Italian Anti-Defamation League was mollified, but a much worse brouhaha soon broke out over a two-part drama called “The Big Train,” whose first episode aired on January 5, 1959. In its storyline, mob enforcer Frank Nitti goes to Alcatraz prison but is treated more like a celebrity than a hood by the prison guards, and a scheme to jail-break Nitti soon develops. Part one absolutely infuriated the present day warden of Alcatraz. The plot was made-up, to begin with, and the very idea guards would coddle, much less help any convict to escape, offended him professionally and personally. Starting Monday morning after the broadcast, the warden began to raise hell. He contacted every important office-holder he knew in government. His threat was simple. If the second episode was aired, he vowed to move heaven and earth to get the American Broadcasting Company’s license revoked. ABC even then was worth a billion dollars; and the warden had an incalculable amount of deadly serious clout at the highest levels. The threat was far from idle, but, on the other hand, broadcasters cannot blow with the wind, not only because rights of free expression are involved, but because programming would become impossible if anybody could stall any series at will. A solid week of increasingly frantic dithering shook up the ABC executive suites. The impasse seemed unbreakable. The warden was not interested in backing down and neither was the network. Finally, literally a few hours before “The Untouchables” was due to go on, somebody thought to call Herb Borkland. I’ll never forget, although it took years to realize what I’d been in on the birth of. The telephone rang in our warm little “womb room” next to the kitchen, and Borky answered. Mum and I saw him get immediately very thoughtful while he listened. I can remember what he answered as clearly as if it were yesterday. The rest, like the man said, is History.